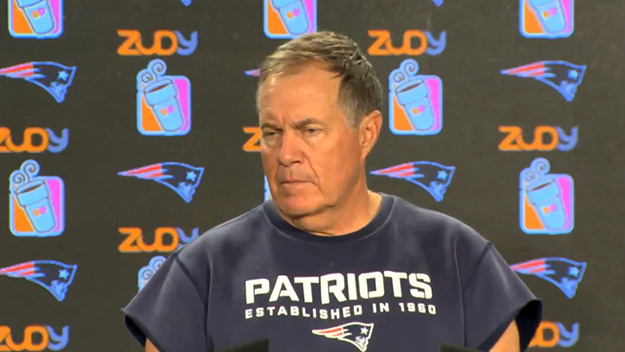 After addressing the media on the first day of training camp and immediately declaring that Tom Brady would resume his long-time role as starting quarterback of the Patriots following his 4-game suspension for doing nothing, Coach Bill Belichick thought he had put to bed any question of who would lead the team this season to its conclusion. That is, until the next day, last Friday, when a reporter pursued the issue with a series of questions trying to get Belichick to recant on his affirmation the previous day and leave the door open for a potential quarterback controversy. While we should all understand it is a reporter's job to ask the tough question to try and elicit a response in order to create an interesting story, we also should know that Belichick will never tip his hand. He'll make whatever move is necessary in advance and then deal with the consequences later. When it comes to questions that he deems as potential distractions to the team, he always offers the same terse responses, much to the frustration of many, but also to the amusement of some as well. Belichick often gets criticized in the media for his often mundane, generic, discourteous, and monotone responses to tough questions, but let's be clear . . . his responses are always calculated and careful. He will not even dare offer any information that may be misconstrued or interpreted in a way that would be to the detriment of the team's morale in the locker room or their performance on the field. Belichick has navigated potential quarterback contraversies in the past, drawing both admiration and criticism from fans and media alike. In every situation, guess who ended up being right? Yup, The Hooded One. The following are quarterback controversies the coach addressed in the past and several of the outcomes of these decisions transformed him from a great defensive coach to an NFL legend. 1993: Belichick benched Cleveland hometown hero Bernie Kosar in favor of Vinnie Testaverde, who up to that point had thrown 32 more interceptions than touchdowns in his career (all with Tampa). Although Belichick later admitted he didn't handle the transition properly between the players and the team flamed out to a 7-9 record after Testaverde got hurt and Kosar was released. The following season Browns went on to make the playoffs and dispatch the Lunch Pail Patriots in the wildcard round of the playoffs. Testaverde had some nice years in his 21 year career, including Pro Bowls with the Ravens and Jets. Conversely, after being released, Kosar finished the '93 season with the Cowboys and then quietly finished his career with the Dolphins. During these last two career stops he totaled 3 starts. The story did not end well for Belichick after team owner Art Modell moved the team to Baltimore and the entire organization self destructed into a 5-11 season and a dismissal for the then Hoodless One after the 1995 season. 2001: The fairy tale that changed the franchise. After Drew Bledsoe went down with a chest injury after a massive hit by Mo Lewis of the Jets severed an artery, relative-unknown Tom Brady pinched for the then franchise QB. Bledsoe was 0-2 in his starts up to that point. The season turned around immediately under Brady as the team compiled an 11-5 regular season record. Even when Bledsoe was cleared to play, Brady continued to start. Even when Brady got hurt in the AFC Championship at Pittsburgh and Bledsoe reversed roles by coming on the bench and performing admirably in the Patriots 24-17 victory, Belichick decided to start a gimpy Brady in the Super Bowl as the Patriots erased an ugly franchise history with its historic 20-17 upset over the Greatest-Show-On-Turf Rams. It is important to note that during that season, to his credit Bledsoe never created a public distraction, nor did he take out his frustration on Brady, such as Rob Johnson did on Doug Flutie. Even after Brady led the team to its first Vince Lombardi trophy, there were still rumblings in the media and among fans about whether Brady or Bledsoe would start in the future. The Patriots addressed the issue quickly in the offseason by trading Bledsoe to Buffalo for a first round pick and Drew had some nice seasons with both Buffalo and Dallas. As we know, Brady went on to lead the Pats to 3 more Super Bowl victories and emerged as arguably the greatest quarterback of all time. As difficult as the Kosar-Testaverde decision was, the Bledsoe-Brady decision was much more risky with a lot more downside. If Brady did not develop as he did and the team ended up losing enough games to miss the playoffs, Belichick may have been fired and the team could have backslid into its old embarrassing history. Instead, the Patriots are now one of the storied franchises in the league along with the likes of the Steelers, the Cowboys, the Packers, and the 49ers. 2008: Many fans may not remember this decision Belichick made to NOT bench Matt Cassel during the 2008 season. After the team got smoked in San Diego 30-10, the media and some fans got restless and asked the coach about benching Cassel. The team went 8-3 the rest of the way including 4 wins in a row to end the season en route to an 11-5 season, although the team did not qualify for the playoffs due to a tiebreaking scenario in which both Baltimore and Miami advanced due to better conference records. After the season, the team franchised the restricted free agent and then traded him along with franchise pillar Mike Vrabel to the Chiefs for a 2nd rounder (which turned out to be safety Patrick Chung). If Belichick had panicked after the loss to San Diego and then benched Cassel in favor of then backup Kevin O'Connell, the season may have unraveled quickly and they may have received nothing for Cassel on the free agent market because his value would've delivered no compensation. Since Cassel finished with 21 touchdowns, 11 interceptions and nearly 3700 yards, the team franchised him and was able to improve their draft pick compensation in the trade with the Chiefs from a third to a second rounder. 2014: "We're on to Cincinnati." That was the memorable line of the 2013-4 season, which came to represent the team's ability to turn the page after a bad game . . . or as we saw in the playoffs . . . a bad half, a bad quarter, or a bad turnover. But on that Monday night at Kansas City after the Pats got blown out 41-14 some in the media immediately questioned whether Brady was finished and it was time to hand the job to rookie Jimmy Garappolo, who led the team down the field on a nice scoring drive in garbage time. During his Wednesday press conference, Belichick responded to every question about the quarterback issue with the same comical response. Over his long career Belichick has gambled and won with each of his quarterback choices. He also has never provided any hint to the media before he made these decisions. He also has never waffled on the decision when it comes to the most important position on the football field, such as many head coaches have done over the years. We shouldn't expect anything different this season and in any future campaign as long as Belichick is running the show. When Brady's time is finished with the team it will already have been decided officially behind closed doors before the media and the fans learn about it.